The tech of the future is on display today at The Universe of Tomorrow! 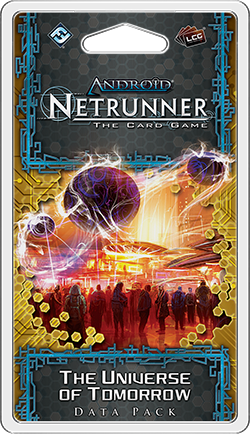 The Universe of Tomorrow is the sixth and final Data Pack in the SanSan Cycle for Android: Netrunner, and it is now available at retailers throughout the United States and online via our webstore. Availability in other regions may vary. Sprawling along the western California coastline from its northern edge in San Fransisco to a southern border at San Diego, SanSan is one of the largest American megacities and the number one place for all the top tech. 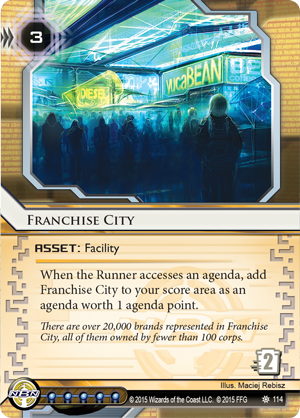 Throughout the SanSan Cycle, we've seen this megacity and its diverse neighborhoods brought to life as each Data Pack has focused on the meatspace, culture, themes, and assets of a different region. The Valley introduced us to the bleeding edge biogenetics being researched and discovered up in Biotech Valley, home to many of the world's leading biotech firms, as well as Jinteki's massive J-Plex. From the Valley, our tour led us south to Breaker Bay, where the students and faculty at the University of the Californias at Breaker Bay are continually testing the limits of technology, finding clever ways to make new uses of it, and pushing it forward. Next, we explored the rise of the "chromehead" culture in Chrome City, where fashion follows the functionality of a wide range of cybernetics. Where the "Big One" caused the San Andreas fault to fall away from America's western coast, The Underway opened up and became home to an eclectic blend of entrepreneurs and cultures. It also became a hotbed of criminal violence, ruled in effect by the members of the street gang Los Muertos. Most recently, our tour led us to the star-studded streets of Old Hollywood, where NBN's Haarpsichord Studios are hastily making sensies and promoting the meteoric rise of their newest stars. Now, at the end of our tour, we head toward the edges of the East California desert, where the world's largest Corps put their upcoming tech on display at The Universe of Tomorrow expo. Lying near the heart of the expo is the Worlds Plaza (The Universe of Tomorrow, 116), which features a beautiful holosculpture by Martian artist Zhang Yi Flower that depicts the solar system's three inhabited worlds. It is a breathtaking piece of art and an apt representation of the expo's aims toward the advancement of humanity. Though it began as a temporary system, the expo has become a massive, important fixture in the southern California landscape, and even despite the Weyland Consortium's insistance that the expo's infrastructure should benefit from the very best, most efficient, and most reliable technologies, the Expo Grid (The Universe of Tomorrow, 119) still consumes a phenomenal amount of energy. 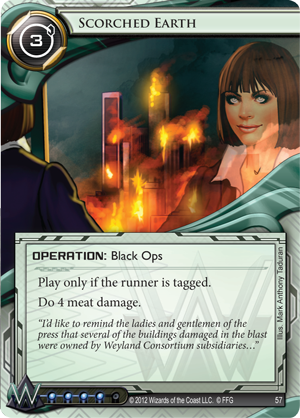 Of course, if you're in the Weyland Consortium, that's not all bad, as you then own most the companies that support the expo's energy use. 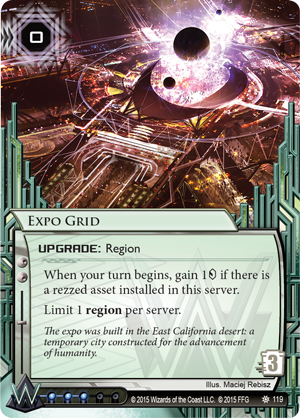 The expo grounds, themselves, are vast. So are the crowds that travel to the expo to witness its marvels and explore the latest innovations. 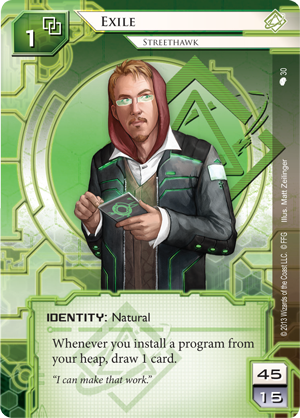 Naturally, then, all the major Corps take pains to ensure their presence is well noted, and each is represented in Android: Netrunner by a new, five-influence asset. 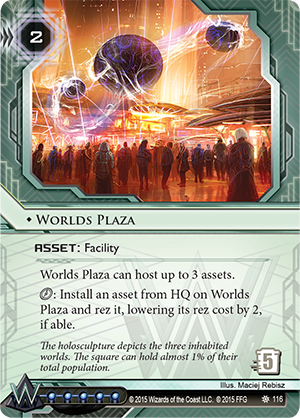 Like the Worlds Plaza, each of these assets helps define the faction that owns it. 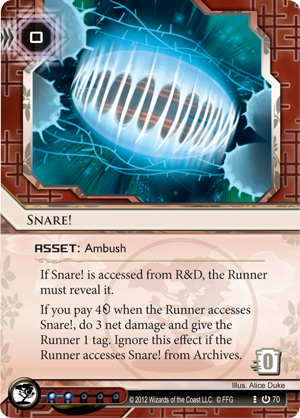 After all, five influence is a hefty price for any Corp to pay to rent such an asset, meaning these assets are most likely to appear in-faction. 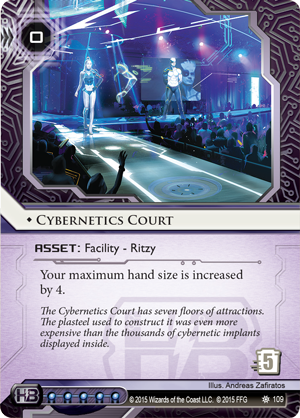 The Haas-Bioroid counterpart to Worlds Plaza is the Cybernetics Court (The Universe of Tomorrow, 109), which with its seven plasteel-encased floors of attractions can nearly double as a secondary Corporate HQ. 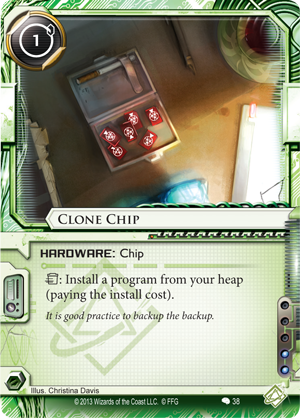 Here, Haas-Bioroid houses thousands of cybernetics implants and puts them on display. 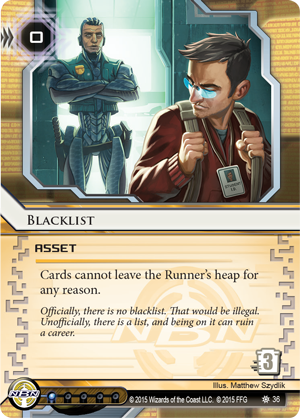 In the game, this zero-cost asset increases your maximum hand size by four, allowing you to draw more of your assets and agendas into HQ, then secure them behind your ice. 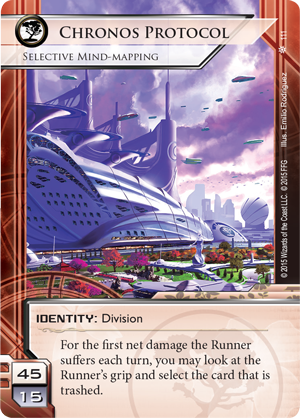 Jinteki, meanwhile, gains the Genetics Pavilion (The Universe of Tomorrow, 113), which we first saw when the Data Pack was first announced. 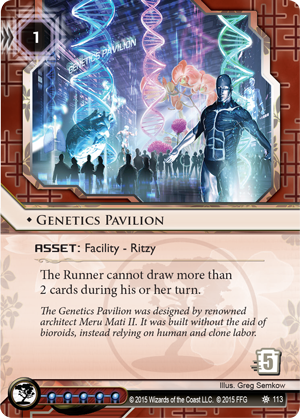 With the cap it places upon the Runner's draw each turn, the Genetics Pavilion forces aggressive Runners to rethink their strategy of running first and drawing second. 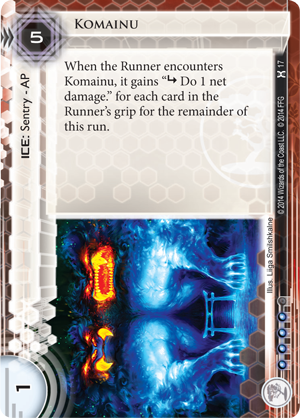 Any early hit from a Komainu (Honor and Profit, 17) or Snare! 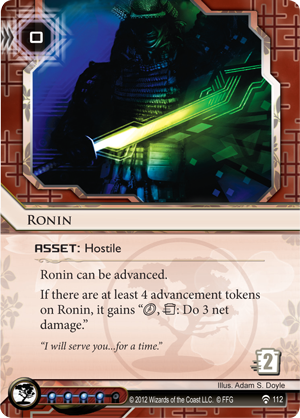 (Core Set, 70) could easily set up a lethal strike by a Ronin (Future Proof, 112). While most megacorps do best to keep their proprietary data securely under wraps, NBN is frequently in the business of making certain their projects not only see the light of day, but every light, everywhere. 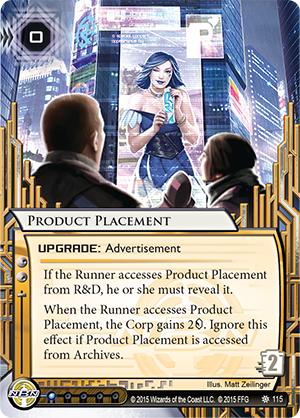 After all, in Franchise City (The Universe of Tomorrow, 114), NBN oversees the Product Placement (The Universe of Tomorrow, 115) of more than 20,000 brands, all of which are owned by fewer than one-hundred corps. Should a Runner steal an agenda related to any of these products, then, NBN can simply cash-in, paying three to rez and score Franchise City for an agenda point. Of course, these valuable assets only benefit you while they're in play. 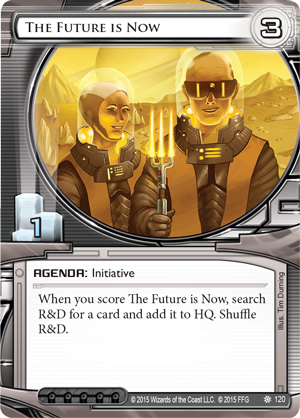 To dig them out of your deck, then, you might consider running one or more copies of the new agenda, The Future is Now (The Universe of Tomorrow, 120). 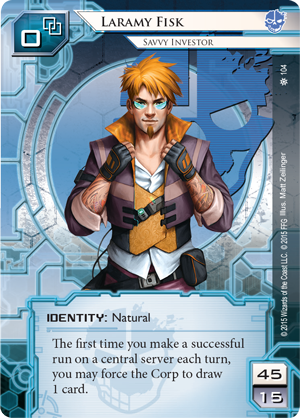 While this agenda bears a fairly mundane ratio of one agenda point to three advancement, it introduces a powerful, universal "scrying" effect, allowing you to search through your Corp deck for whichever card you need most. 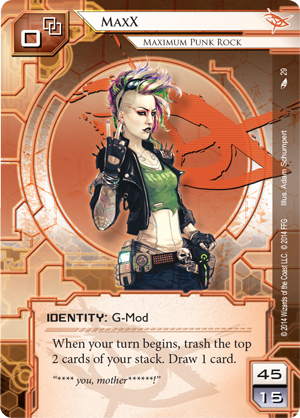 Against MaxX (Order and Chaos, 29), Exile (Creation and Control, 30), or any Shaper running Clone Chips (Creation and Control, 38), you might dig up a copy of Blacklist (Breaker Bay, 36). 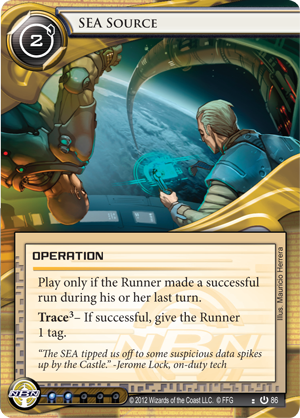 Or, perhaps, if you're playing as Weyland, you'll simply use it to draw more quickly into your lethal combination of SEA Source (Core Set, 86) and Scorched Earth (Core Set, 69). The options are limited only by the cards you build into your deck. 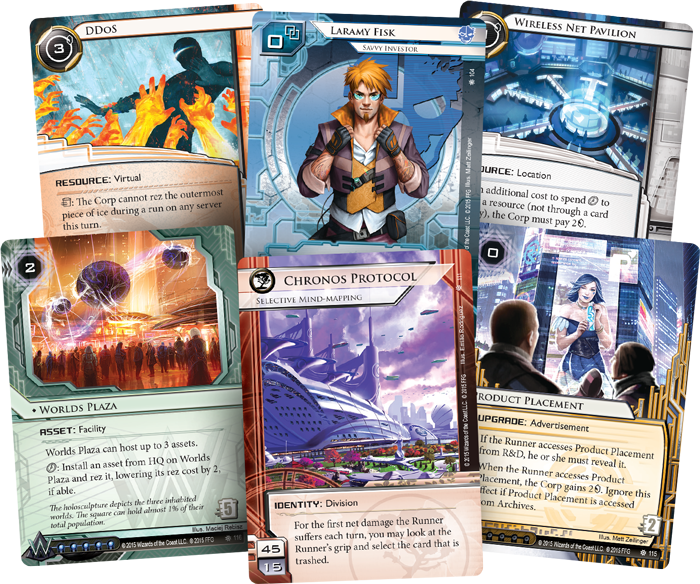 In addition to its new, five-influence assets, The Universe of Tomorrow introduces two new identities, Laramy Fisk (The Universe of Tomorrow, 104) and Chronos Protocol (The Universe of Tomorrow, 111). You'll also find new events, programs, and hardware for the Runner, plus team sponsorships, public relations efforts, and a tour guide to lead you through it all. Look for the newest tech at your local retailer. The Universe of Tomorrow is now available throughout the United States. Availability in other regions may vary.